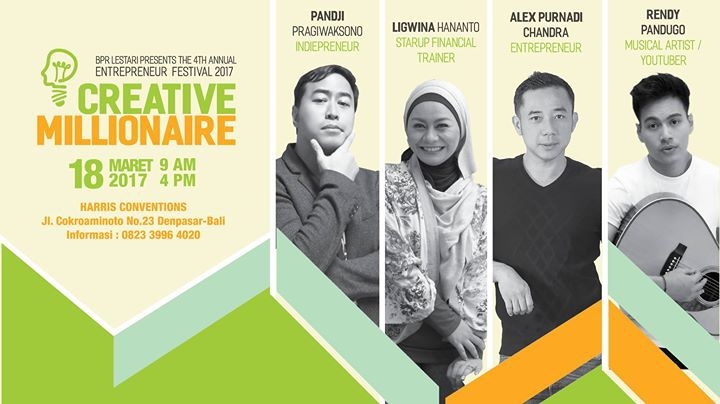 Entrepreneur Festival is an annual event aimed at entrepreneurs, young people and investors, especially in Bali. Since in the title since 2014 last year, the party entrepreneurs who often presents the national speaker is always crowded with visitors. In 2017, for the fourth time Entrepreneur Festival will be held and is taking the theme of Creative Millionaire. The theme responds to the current conditions, where the millennial generation which often move swiftly and maneuver quickly, is very familiar with the technology and is connected all the time. Remarkably, they are the generation who then broke the old rules, many of them managed to be a Millionaire at a very young age. That is why, this event brings a number of Creative Millionaires, young people who successfully built his business empire in the early years. Among the invited are Pandji Pragiwaksono, a rapper and also a Comic, who is talented in making a successful career out of a creative business. The second speaker is Ligwina Hananto, founder of the firm QM Financial, paying attention to how the start-up managing their finances. And there is also Rendy Pandugo, a successful musician popular after uploading his work in the social media, and Alex P Chandra, the publisher of Money&I Magazine and founder of Lestari Group.